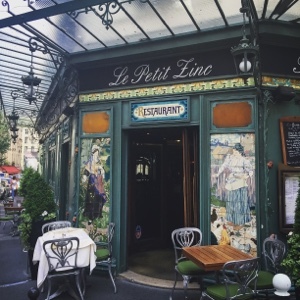 We decided to visited Le Petit Zinc on our last evening as we had admired the the exterior throughout our trip as it was located round the corner from our hotel. As the restaurant had disappointingly run out of both sea urchins and razor clams we opted for the set menu, which has the option of a starter/main or main/dessert for €22 or all three courses for €29. We were seated next to a lovely couple from Canada who told us they visit the restaurant every time they travel to Paris, which was a promising start. 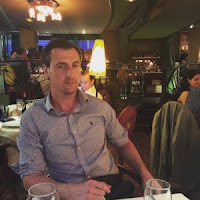 Famous for its Art Nouveau decor (which is utterly beautiful) and seafood specialities, we were somewhat disappointed with our meal. Russell's french onion soup was nice, but not as good as the soup I had at Le Petit Chase, and my starter of seared foie gras was served un-seared... (the Rib Room in Knightsbridge serves a beautiful dish which is 100 times better than the one I ate in Paris). Surprisingly, I can't remember what I had for my main course (which is not a good sign). Russell ordered steak again, but commented that it wasn't as good as last night's beef. 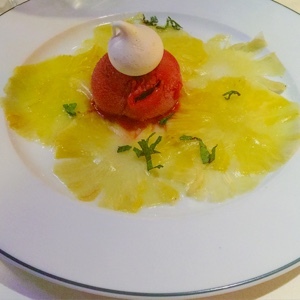 For dessert my pineapple carpaccio with raspberry sorbet and basil was extremely refreshing. But all-in-all, the service was very slow and un-personal (with only two waiters serving every table inside, the staff were extremely over-strecthed). The experience was lovely as it was our last meal in Paris and we enjoy each others company, but I wouldn't recommend the restaurant and wouldn't go back.